The Latin American Caribbean Studies’ (LACS) yearly gallery, Braceros, a photographic documentation of Mexican migrant laborers expressed through the lens of the Hermanos Mayo, a photography collective, opened on Sept. 5 at the Social & Behavioral Sciences Building in Rm. 320. The gallery, curated by John Mraz, curator of international photographic exhibitions, and underwritten by the Mexican government, explores the Bracero Program, a labor loan program between the United States and Mexico that lasted from 1942 to 1964. The Hermanos Mayo (the Mayo brothers) were refugees of the Spanish Civil War that emigrated to Mexico. They shared a sense of dislocation that can be felt in the images of the braceros going to the U.S.
Krislyn Rodriguez, a junior atmospheric sciences major, LACS minor and Latin American Student Organization social chair, said that she never knew these images existed and that it’s important for herself, Stony Brook and Latin culture that this exhibit is here. The exhibit is organized into six themes — contracting centers, la ciudadela, farewells in the Buenavista train station, protests, the experience and the return — that document the overall experience of the labor movement. 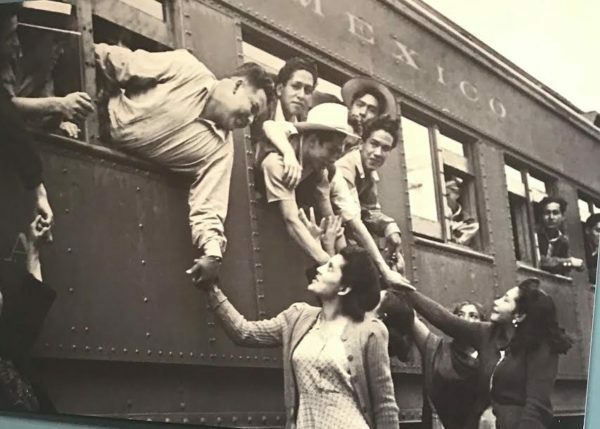 Eric Zolov, director of LACS and a professor in the history department, said that the point of the exhibit is to humanize labor and to bring historical context to modern migration issues. As you progress through the pictures, the number of people you see in the images goes down. The people look hopeful in the beginning but by the end of the exhibit, there is a sense of restless fatigue. Ximena Lopez Carrillo, Ph.D. candidate studying mental health and psychiatry in the United States and Mexico, said that the Hermanos Mayo were paid by the Mexican government to take photos of public works projects. They documented the Bracero Program and other working-class struggles. The term “bracero” comes from the Spanish word for a manual laborer and the term “brazo” within the word means arm, showing how these are people who work with their hands. The Bracero Program began in 1942, during World War II, to prevent a labor shortage in the U.S. It lasted longer than expected, ending in 1964. Similar to today’s outlook of how immigrants will compete for jobs and lower wages, American farm workers were concerned about these issues back then, too. According to the Bracero History Archive, the braceros, as well as domestic workers, had safeguards in their contracts, such as free housing, adequate sanitary, reasonably-priced decent meals, occupational insurance, wage regulations and guaranteed employment for three-fourths of their contract. The braceros suffered because employers took advantage of the cheap and plentiful labor and broke or ignored many of the rules in braceros’ contracts. Fernando Acevedo, a sophomore psychology major, said that he learned about the Bracero Program in a University Scholars class last year about border relations between the U.S. and Mexico. Even as a Mexican-American, he didn’t grow up knowing about the program and believes that it is something that should be known, but isn’t widely taught. The exhibit will be open until May and is open Monday to Friday from 9 a.m. to 4:30 p.m.